That Does Everything You Want……and A Whole Lot More! YouTube, Vimeo and dozens of other sites! With tons of features that will improve your traffic, minimize bounce rates, and much, much more! You can even use it to get videos from your visitors, as well as more leads or subscribers! We’ve also thrown in a powerful front-end video submission form feature – allowing any registered member to submit videos. Now, it’s easier than ever for your visitors to add videos from YouTube, Vimeo or any other embeddable source, as well as upload their own videos directly via your site! 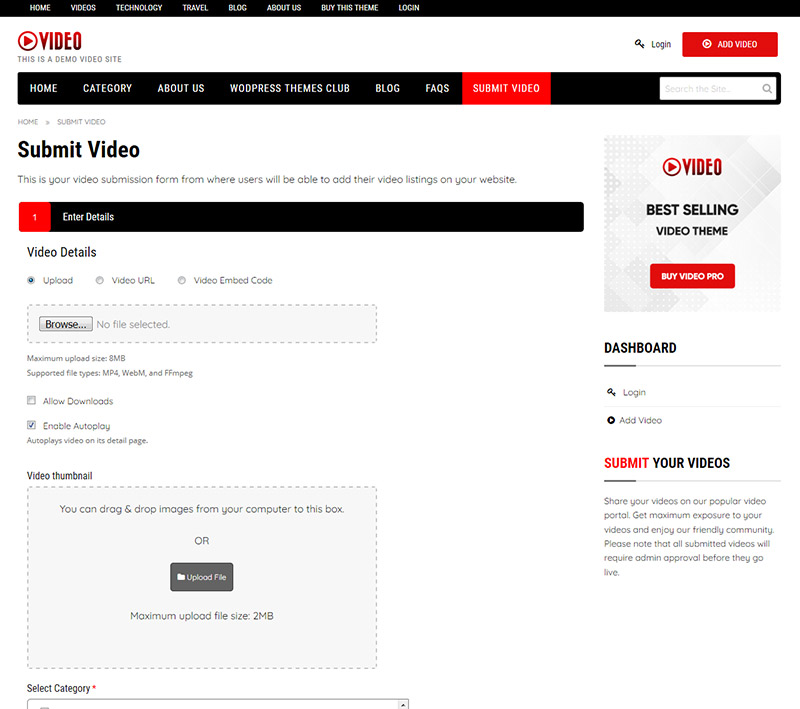 With the handy “submit video” page template, you and/or your visitors can upload videos via the site’s front-end, quickly and easily. Want to moderate submissions before publishing? Not a problem! Your site will work and look great on any device! The Templatic Video Theme has been built from the ground-up with multi-device users in mind. It maximizes mobile displays to the fullest while leveraging the display capabilities of PC, Mac, and other desktop displays, at the same time! Our innovative, mobile-friendly design ensures total compatibility with any device your visitors are using to access your site, regardless of OS or platform! to meet your exact needs! We’ve developed the Templatic Video Theme to be fully customizable. Every element is widgetized and can be managed/customized to your needs and desires. We even allow larger elements, such as a featured slider, to be moved or placed anywhere on the page, with easy ‘drag and drop’ control! Our state-of-the-art theme can easily handle any type of media, whether it’s text content, video, audio or even a combination of any! Some more features that help you blog like a pro! Add images, videos and other media to posts wherever you want, with full layout control, quickly and easily! Create an unlimited number of parent/child categories and subcategories – on the fly! With the WordPress real-time customizer tab, you can fully alter the look and feel of your website, on demand! Change colors dynamically, view your site in real-time and test for response and/or engagement. Find out what works and what doesn’t, instantly! Easy management and customization of header and body background images! Full control and default settings via Google fonts as well as custom font size settings! Change colors dynamically view your site in real-time and test. Killer widget arsenal – ready to use! Display your videos in either grid or list view. This widget is what you see displaying most of the videos in our demo. Show the thumbnail/featured image of the latest video from any selected categories. Can be displayed as list or grid. Display related and popular videos or posts with a series of tabs. Choose the number of entries to be shown in each. Show videos or posts from the same category as the one being viewed. Works best on video or post detail pages. Include a static banner image or insert Google AdSense or any ad network code. Use HTML and inline CSS to style the content to display however you like. Two metrics are available for determining popular posts: comments and views. Works with both videos as well as standard WordPress posts. Creates a slider with a short description and a fully-functional video. Choose which video categories to display in the slider, and easily set the number of slides to show. Provide a link to each of your social media profiles or channels. Add as many as you need, you can even upload custom icon for each! WooCommerce is a highly-advanced, free eCommerce plugin which allows you to easily create a fully-functional online store on your site. You can install it via your WordPress plugins tab, right on your dashboard! Use this video thumbnails plugin to quickly create a thumbnail or featured image based on the embedded video. The plugin works with most popular video sharing websites. Install the YouTube Channel Gallery plugin to display a gallery of videos from a specific YouTube channel. Click here to see it in action! Use WPML to easily showcase your Video-powered website in multiple languages. Translate both the actual content and regular text strings. Use plugins like Contact Form 7 or Gravity Forms to quickly setup contact or inquiry forms for your visitors to connect with you. Easily insert a form into any page or post on your site. Take full advantage of advanced SEO options such as WordPress SEO by Yoast and All in One SEO Pack. Search Engine Optimization is critical for getting your site ranked higher on Google! Add rich snippets to your videos for maximum Google exposure using the All in One Schema.org Rich Snippets plugin. For more on rich snippets and how they can help, click here. Use the easy CSS editor to make the theme your own in virtually every way. Every change you make is saved and protected within the database, unlike other themes. They will not get erased or deprecated by future theme updates! Each video detail page within the theme includes easy-to-use, non-obtrusive social sharing buttons for various social networks such as Twitter, Facebook, Google +, Pinterest and LinkedIn. Use this template when you want visitors to focus on your content distraction-free. Your sidebar widgets will not be displayed on any pages you select to have full-width. Utilize one of the dozens pre-coded design templates for styling your own content. And customize any to your liking! To see what’s available visit our demo site. Never worry about image sizes again! Whether you’re creating a new video entry or a blog post, each image you upload will be automatically resized to fit the area it needs to be displayed in. Showcase links to your content in two separate menu bars! One displays above the log, and one displays below. Both are fully controllable via WP’s default menus tab. See the Templatic Video Theme in action! Here are just a few of the sites that are crushing it with their audiences using this innovative, dynamic theme! Take a full tour – visit our demo! I am thankful I chose this theme! After testing out so many other themes, I am thankful I chose this theme from Templatic, All themes are amazing & documentation is very easy to follow. We did not experience this type of service with other businesses, which was a key factor in choosing and staying with Templatic. Get The Theme License That’s Right For You! Whether you own one or 1000 sites, you’ll find the Templatic Video Theme’s licensing to be an incredible value for all the amazing features and capabilities that you get! Obviously, we think Templatic is the best Premium WordPress Themes provider. But, we’ll admit we are little biased. In our 10 years of WordPress community experience, we learned along with robust product code, backup of the world-class support team is the key that unlocks the true success of any project. Check for yourself what our customer thinks here. Claim Your Copy of the Video! What kind of video websites can I create with this Video WordPress theme? This Video hosting WordPress theme being extremely customizable can be used to create a variety of website. You can use as a video blog WordPress theme, or video portfolio website with videos on one or more subjects. While you can also create an online video portal with multiple categories. Can I create a membership video website with this theme? Yes you can create a functional membership video website with this WordPress Video blogging WordPress Theme. The user registration and management features of this video specialized website template will let you manage your members easily. How to download & use this Video WordPress Theme? Within minutes of submitting your order, you will receive an email confirmation. It will include your account information and login to our Owner Dashboard. There you can download the latest, most up-to-date version of this YouTube Clone Video template. How will the dummy content you provide help me? The sample data makes creating your Video WordPress website easier. You can insert it into your newly installed Video website with just a single click. It will update your video portal website with sample content and widgets arranged in respective places. All you are supposed to do then is to replace the sample data with actual content. Where to host my video gallery website? You can subscribe to any popular hosting service that promises fast and efficient performance and highest uptime to host your premium Video WordPress theme with video content. You can prefer WordPress optimized hosting for your Video gallery WordPress theme. How long can I use this multipurpose Video WordPress theme? Forever. You own this Video Streaming WordPress theme once you purchase it. While support and updates are limited to the time period specified in your license, you can still use the video WordPress theme for as long as you want. How can the visitors upload their videos by front end? You can allow front end visitors to submit their videos on your Video streaming website effortlessly. 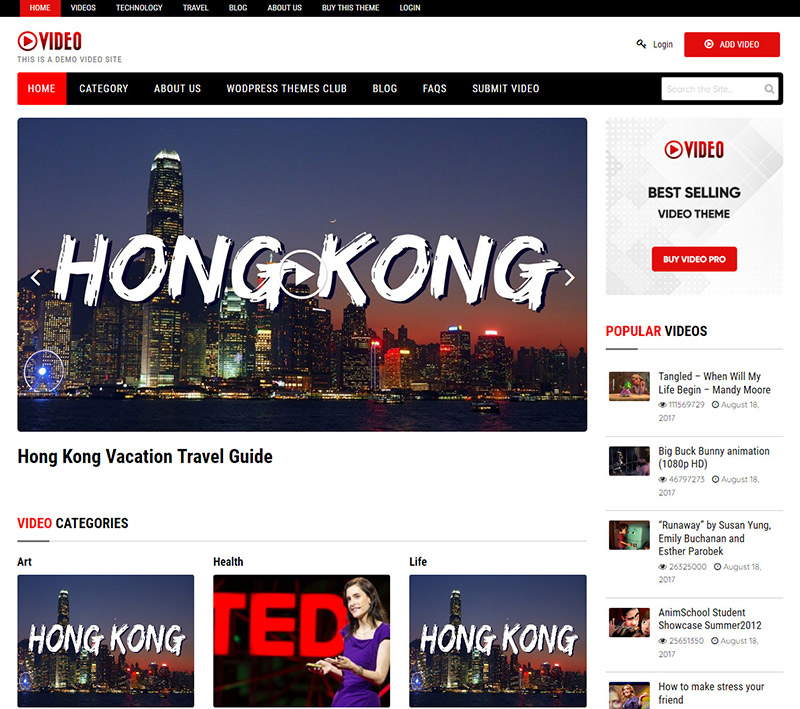 This video website template comes with a ready to use front end video submission form through which your visitors can register and upload their hobby videos, video tutorials, video clips, etc. Can I customize/modify this video dedicated WordPress theme? With this multipurpose Video WordPress theme, you can create a video website of your choice in minutes. You can change all the colors and background of your website. Besides, the homepage of your Video WordPress Template is fully widgetized and can be restructured by rearranging the widgets. Who can use this YouTube Clone WordPress Theme? The Video gallery WordPress theme can be used by freelancers, web designers, video bloggers, video production teams, photographers, and videographers, with little to know technical knowledge. The video theme guide and technical support will help you set up your video WordPress website on your own, without hiring programmers. How long will it take to get started with my video website? It takes a few minutes to install this professional video WordPress theme. With the sample data installed you will have a ready to use Video Portal website as shown in demo. With the easy customization options and the front end video upload features, you can get started with your video website as soon as you update it with your data. While it takes days or months to create a video website traditionally, this Video Portal WordPress theme is crafted to let you get started in minutes. Create your media gallery website with WordPress and start generating revenue by ad banners. 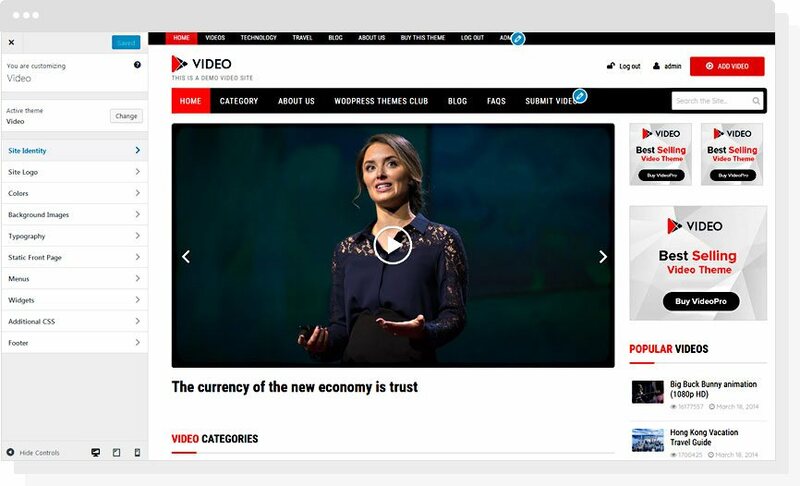 Videos on your website makes it more interesting and user friendly. Therefore, it’s easy to attract audience to your video streaming WordPress website. 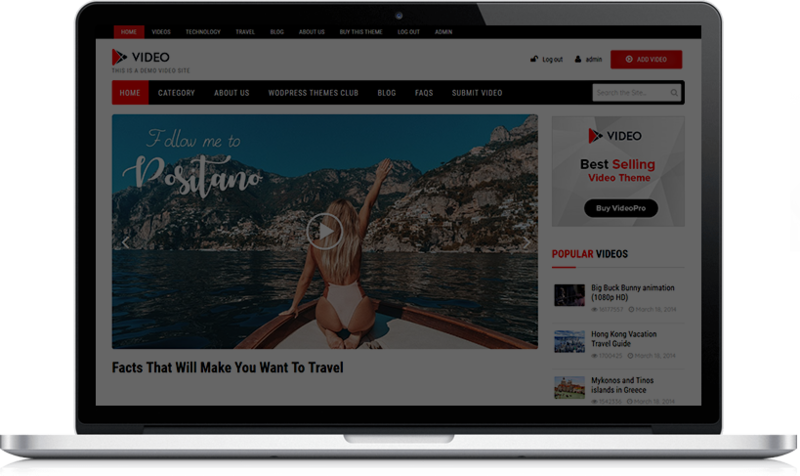 This powerful Video theme can be used to create video blog websites, video magazines, online educational websites with video tutorials, or a youtube or vimeo like website, etc. The highlight of this Multipurpose Video WordPress theme is its ease of use. With this WordPress Video template, creating your video website becomes quick and easy. With features like powerful customization settings, automatic video thumbnail generation, fully functional front end submission module as well as video embedding features, you can create a video website of your choice. We look forward to helping you take your site to the next level! © 2008 - 2017 Templatic. All rights reserved.